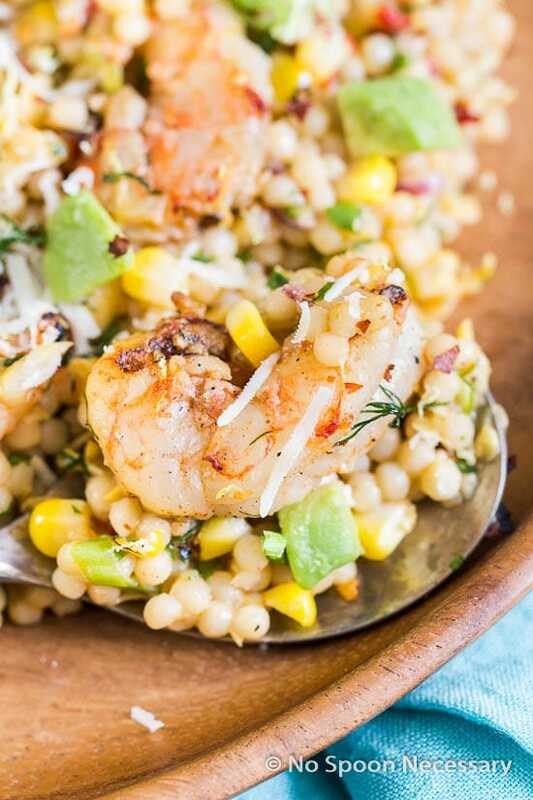 Pearl couscous loaded with plump grilled shrimp, smoky, charred corn, summer squash and avocado. When it comes to sitting down and writing a blog post recently, there has been something apparent going on, and it has been weighing on my mind. I don’t have anything to talk about other than my new digs, and the place I now call home has been taking over No Spoon Necessary. I’m not sure if this normal… when you move not only to a new house, or a new city, but to a new state entirely… for it to change every facet of your life. Nothing here is the same as it was back in Florida. I can’t help but want to talk about it, and how tranquil this place is. But, I am starting to get annoyed with myself. I DO NOT want to be that person who comes across as having “the white picket fence kind of life”. Mostly because, that is NOT reality. Life is not all sunshine, butterflies, and plentiful pots of gold at the end of a continual rainbow. I like to keep it real here. You don’t have a mailbox outside of your house. You have a physical address for deliveries and a P.O. Box for lettered mail. This will confuse all of your relatives, friends, anyone and everyone who needs to make contact with you via physical mail… unless they live near you, then they can simply get on their horse and buggy and drop it off themselves. People actually pay to have more pine needles dropped on their yard for aesthetic appeal. Green grass is a thing for the Non-North-Carolina-Country-Residing-Bumpkins or Tim McGraw. You have the approved pine needles on your lawn, yet you still need to mow the teeny tiny tid bit, almost a half-acre, of grass that is growing. You have a septic system. And if you are anything like me this scares the ever living crap (pun intended) out of you. Does this thing have an alarm that sounds when it is full? Will I go to flush one day and the whole tank reverses and floods our house with God only knows what?! Ewww. The sound of wasps and mosquitoes are louder than your neighbors. You have never actually seen your neighbors, so maybe they don’t even exist. There is no such thing as rush hour traffic. You start to wonder… does anyone else live here? The back roads into town are 55 miles per hour. (#Weeeeeee-eeee) And you might pass like 10 people on each and every trip. So there you have it. I can check off every single item, therefore I most definitely live in the boonies. Do you?! We could possibly be neighbors and neither of us even know it! Naturally, I had to cook something with my new found friends… I mean, I did already purchase those halfhearted, “Be Fri” and “Est Ends”, necklaces for us! 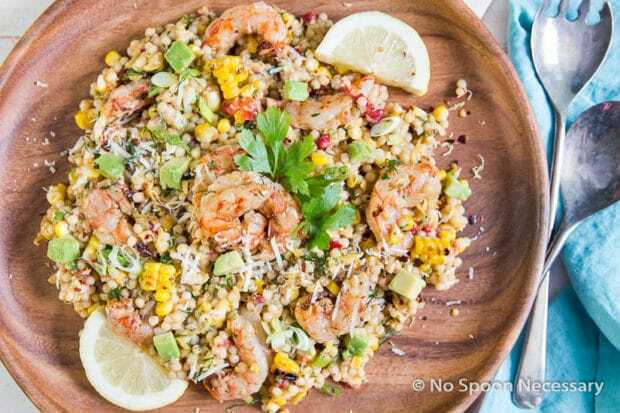 I certainly hope my shelled and veined friends feel like I did them justice with today’s dish – Shrimp, Corn and Summer Squash Pearl Couscous Salad. I may be bias, but this couscous certainly tantalized my taste buds. It is creamy, rich, jam pony’ed with fresh produce and fabulous flavor; yet light and healthy. 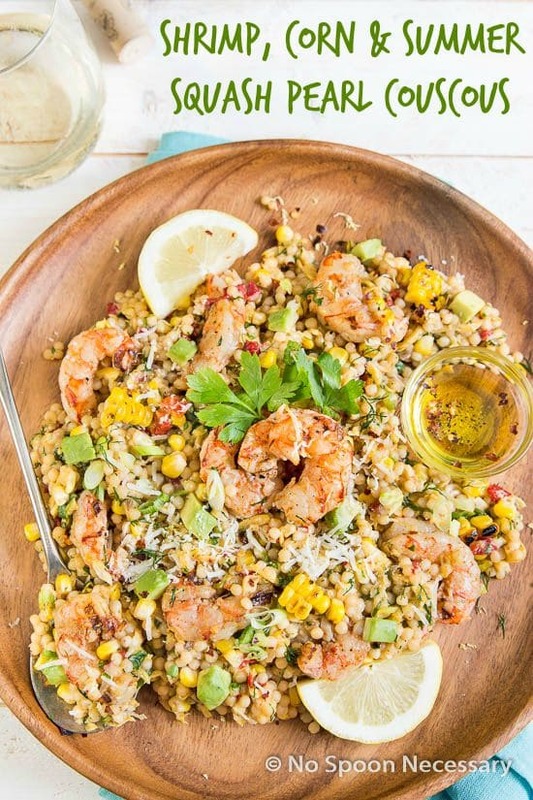 This dish is my ode to summer…and to my beloved Carolina Shrimp. 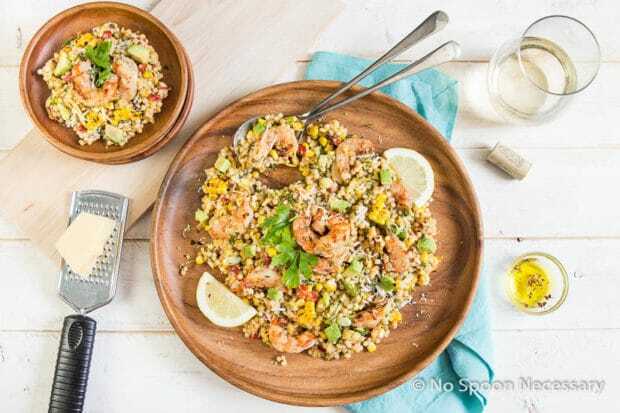 While you could just accordingly grill my buddies, Mr and Mrs. Crustacean, and devour them plain… then you would miss out on all the scrumptious summa’ lovin’ in the form of the veggie packed couscous. And I know you don’t want to miss out on that! 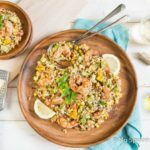 The pearl couscous salad is supa’ dreamy and loaded to the gills with bites of smoky grilled corn, fresh and finely grated sweet squash, bits of roasted red pepper, chunks of creamy avocado, and speckled with loads of herbaceous dill and parsley. Then it is finished with a tangy, silky smooth olive oil based dressing. When everything gets lovingly tossed together, this dish becomes a symphony of stellar scrumptious flavor. Essentially, it becomes everything you want in your summer-tastic life. While the list of ingredients for this salad may seem long, the actually process of whipping this dish together is quite easy. But, don’t take my word for it! You must try this one out for yourself! 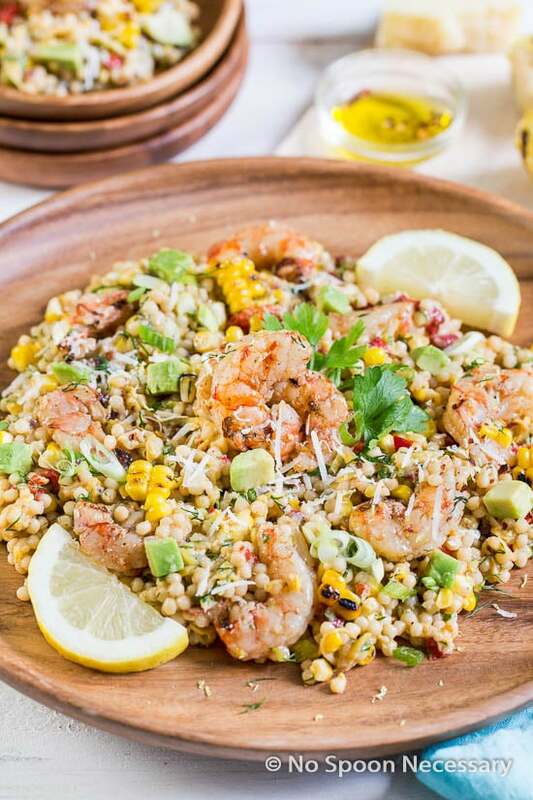 Until next time – make besties with your shrimp, toss this dish together, and celebrate what remains of summer! Cheers! 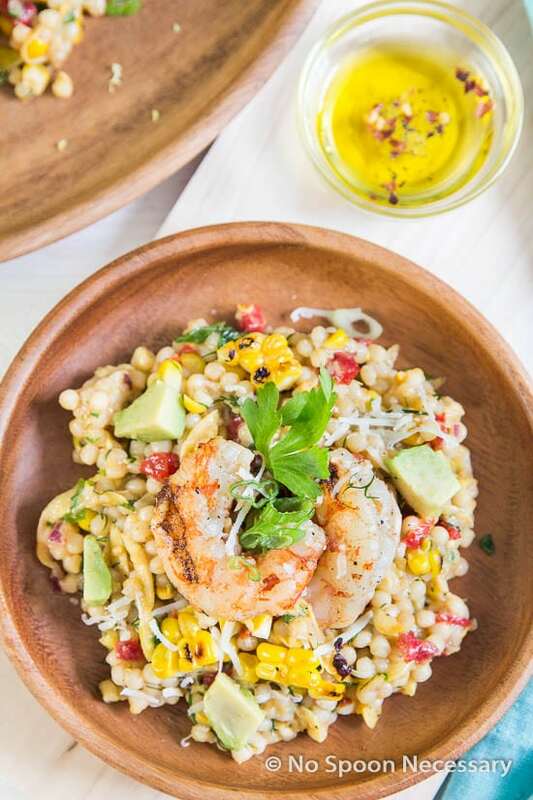 Pearl couscous salad loaded with plump grilled shrimp, smoky, charred corn, summer squash and avocado. Prepare the Shrimp: In a medium bowl, combine the shrimp, baking soda, salt and sugar. Toss to coat. Thread the shrimp onto sets of 2 skewers, rotating heads to tails and threading the shrimp so they are snuggly pushed together. Each set of 2 skewers should fit about 6 shrimp. (Check out this link) Transfer the shrimp skewers on top of a baking dish so they are suspended above the bottom of the dish. Place, uncovered, in the refrigerator and allow the shrimp to rest for 45 minutes to 1 hour. Meanwhile, in a small bowl, combine 1 ½ tablespoons of oil with garlic, cumin and chili powder. In a separate bowl combine remaining 1 ½ tablespoons of oil with the lemon juice. Set both aside. Prepare the Couscous: Bring vegetable broth to a boil in a medium saucepan. Add the couscous, salt and butter. Cook until al dente, about 8-10 minutes. Stir in the squash. Set aside and allow to cool. Meanwhile, Prepare the Salad: In a large mixing bowl, combine the red bell pepper, red onion, scallions and garlic. Stir to combine. Add the cooled couscous & squash. Toss to combine. Set aside. Prepare the dressing: In a small mixing bowl, combine the olive oil, cumin, lemon juice, zest, white wine, honey and crushed red pepper flakes. Season with salt and pepper. Whisk well. Pour over the vegetables and couscous. Toss thoroughly to combine. Taste and adjust for seasoning. Set aside in the refrigerator. Grill the Shrimp & Corn: When hour is up, heat grill to high. For the Corn: Grill corn, turning occasionally, until charred and tender, about 10-15 minutes. Remove from heat to a clean work surface. Brush with butter and season with salt and pepper and set aside. When cool enough to handle, remove kernels from cob using a serrated knife. Add to the salad. For the Shrimp: Brush both sides of the shrimp with the garlic and oil mixture. Grill shrimp, turning occasionally, until cooked through (to internal temperature of 140 degrees – shrimp will continue to cook when you remove them) about 4-5 minutes. Transfer shrimp to a clean work surface and remove from skewers. Toss the shrimp in the oil and lemon mixture to coat. Season with salt and pepper to taste. 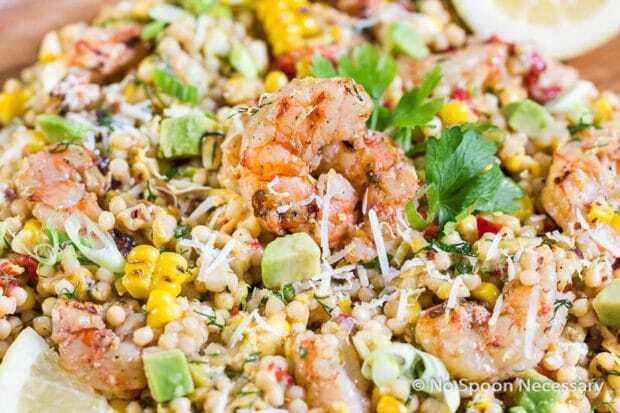 Finish the Salad: Add the shrimp, avocado, fresh herbs, and parmesan to the salad. Toss to combine. Taste and adjust for seasoning. Serve with lemon wedges on the side. *I used a jarred roasted red pepper.